An organization designs a large scale cloud-based web application. The application scales horizontally in a bursting behavior and generates a high instance count. The application requires an SSL connection to secure data and must not lose connection state to individual servers. The figure below depicts an example design for this workload. 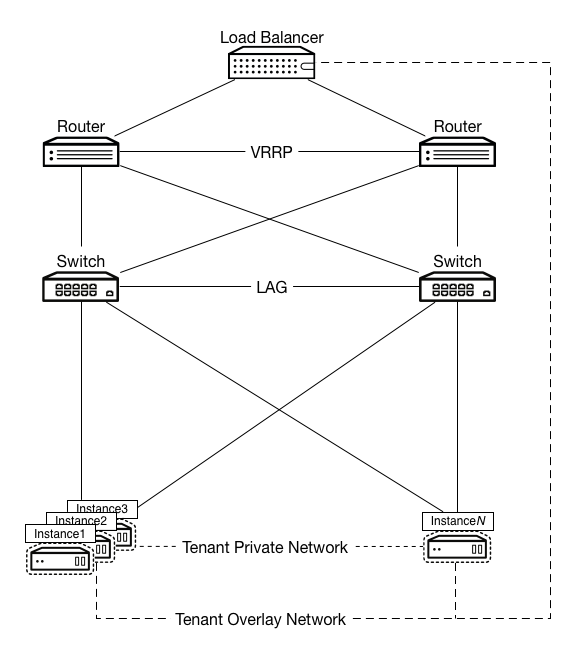 In this example, a hardware load balancer provides SSL offload functionality and connects to tenant networks in order to reduce address consumption. This load balancer links to the routing architecture as it services the VIP for the application. The router and load balancer use the GRE tunnel ID of the application’s tenant network and an IP address within the tenant subnet but outside of the address pool. This is to ensure that the load balancer can communicate with the application’s HTTP servers without requiring the consumption of a public IP address. Because sessions persist until closed, the routing and switching architecture provides high availability. Switches mesh to each hypervisor and each other, and also provide an MLAG implementation to ensure that layer-2 connectivity does not fail. Routers use VRRP and fully mesh with switches to ensure layer-3 connectivity. Since GRE provides an overlay network, Networking is present and uses the Open vSwitch agent in GRE tunnel mode. This ensures all devices can reach all other devices and that you can create tenant networks for private addressing links to the load balancer. Beyond the normal Identity service, Compute service, Image service, and Object Storage components, we recommend the Orchestration service component to handle the proper scaling of workloads to adjust to demand. Due to the requirement for auto-scaling, the design includes the Telemetry service. Web services tend to be bursty in load, have very defined peak and valley usage patterns and, as a result, benefit from automatic scaling of instances based upon traffic. At a network level, a split network configuration works well with databases residing on private tenant networks since these do not emit a large quantity of broadcast traffic and may need to interconnect to some databases for content. Load balancing spreads requests across multiple instances. This workload scales well horizontally across large numbers of instances. This enables instances to run without publicly routed IP addresses and instead to rely on the load balancer to provide a globally reachable service. Many of these services do not require direct server return. This aids in address planning and utilization at scale since only the virtual IP (VIP) must be public. 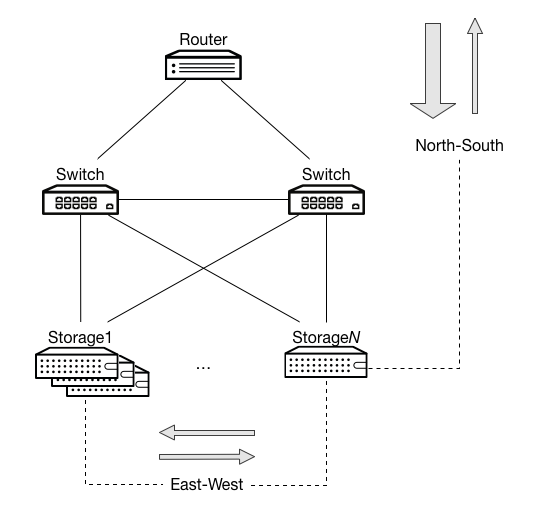 The overlay functionality design includes OpenStack Networking in Open vSwitch GRE tunnel mode. In this case, the layer-3 external routers pair with VRRP, and switches pair with an implementation of MLAG to ensure that you do not lose connectivity with the upstream routing infrastructure. Network level tuning for this workload is minimal. Quality of Service (QoS) applies to these workloads for a middle ground Class Selector depending on existing policies. It is higher than a best effort queue but lower than an Expedited Forwarding or Assured Forwarding queue. Since this type of application generates larger packets with longer-lived connections, you can optimize bandwidth utilization for long duration TCP. Normal bandwidth planning applies here with regards to benchmarking a session’s usage multiplied by the expected number of concurrent sessions with overhead. Network functions is a broad category but encompasses workloads that support the rest of a system’s network. These workloads tend to consist of large amounts of small packets that are very short lived, such as DNS queries or SNMP traps. These messages need to arrive quickly and do not deal with packet loss as there can be a very large volume of them. There are a few extra considerations to take into account for this type of workload and this can change a configuration all the way to the hypervisor level. For an application that generates 10 TCP sessions per user with an average bandwidth of 512 kilobytes per second per flow and expected user count of ten thousand concurrent users, the expected bandwidth plan is approximately 4.88 gigabits per second. The supporting network for this type of configuration needs to have a low latency and evenly distributed availability. This workload benefits from having services local to the consumers of the service. Use a multi-site approach as well as deploying many copies of the application to handle load as close as possible to consumers. Since these applications function independently, they do not warrant running overlays to interconnect tenant networks. Overlays also have the drawback of performing poorly with rapid flow setup and may incur too much overhead with large quantities of small packets and therefore we do not recommend them. QoS is desirable for some workloads to ensure delivery. DNS has a major impact on the load times of other services and needs to be reliable and provide rapid responses. Configure rules in upstream devices to apply a higher Class Selector to DNS to ensure faster delivery or a better spot in queuing algorithms. Another common use case for OpenStack environments is providing a cloud-based file storage and sharing service. You might consider this a storage-focused use case, but its network-side requirements make it a network-focused use case. When a user uploads and stores content, that content moves into the OpenStack installation. When users download this content, the content moves out from the OpenStack installation. Because this service operates primarily as a backup, most of the traffic moves southbound into the environment. In this situation, it benefits you to configure a network to be asymmetrically downstream because the traffic that enters the OpenStack installation is greater than the traffic that leaves the installation. Likely to be fully symmetric. Because replication originates from any node and might target multiple other nodes algorithmically, it is less likely for this traffic to have a larger volume in any specific direction. However, this traffic might interfere with north-south traffic. This application prioritizes the north-south traffic over east-west traffic: the north-south traffic involves customer-facing data. The network design, in this case, is less dependent on availability and more dependent on being able to handle high bandwidth. As a direct result, it is beneficial to forgo redundant links in favor of bonding those connections. This increases available bandwidth. It is also beneficial to configure all devices in the path, including OpenStack, to generate and pass jumbo frames.